A new study from The Hartford and the University of Southern California gives insight into what Baby Boomers are thinking about their future living spaces. 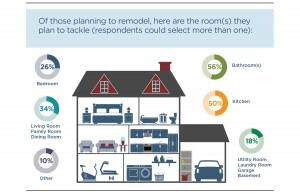 Not surprisingly, bathrooms are tops on the minds of Boomers … including universal design elements that make life easier as we age. Comfort height toilets, like the Mansfield Plumbing SmartHeightTM toilet, tied for one of the products participants were most interested in. When replacing a toilet, the height from the floor to the top of the toilet seat matters for many people — especially when we get older. The standard toilet height is anywhere from 14-3/4 to 15-1/2 inches. SmartHeight toilets are available in heights of 16 inches to 17-1/4 inches, providing more comfortable access for users. For more details on remodeling for tomorrow from The Hartford, click HERE.